In a blog, Mr Zuckerberg outlined his vision to transform Facebook into a "privacy-focused platform." 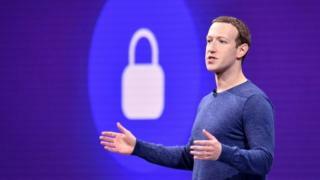 Some critics see the proposed changes as a way of Facebook perhaps abandoning its responsibilities, says the BBC's North America technology reporter Dave Lee. If what happens on Facebook is more private and temporary, he says, it may be harder to hold the site accountable for any perceived misdeeds. "Facebook and Instagram have helped people connect with friends, communities, and interests in the digital equivalent of a town square," said the billionaire founder of Facebook. "But people increasingly also want to connect privately in the digital equivalent of the living room." In response, Mr Zuckerberg said he wanted to develop the social media network into one focused around privacy, reducing permanence, and secure data storage. As part of his privacy goals, he said Facebook would not "store sensitive data in countries with weak records on human rights like privacy and freedom of expression." "Upholding this principle may mean that our services will get blocked in some countries, or that we won't be able to enter others anytime soon. That's a tradeoff we're willing to make," he continued. He did not offer a firm timeline for his vision, but said changes would take place "over the next few years". "I believe we should be working towards a world where people can speak privately and live freely knowing that their information will only be seen by who they want to see it and won't all stick around forever. " "If we can help move the world in this direction, I will be proud of the difference we've made," Mr Zuckerberg wrote. You could argue that it is finally listening to what its users want and responding to their changing habits, rather than introducing its own ideas and then responding to the influx of feedback afterwards - seeking forgiveness rather than permission is not uncommon in the tech sector. Or you could more cynically point out the looming threat of social network regulation coming its way from various governments around the world, and suggest that this new hands-off approach to data (we won't store it, we won't even be able to see it) might help it survive a clampdown on how it uses people's information. The shift to more intimate communications between smaller groups, making those conversations private even from Facebook itself, and no longer keeping data for a long period of time is no doubt designed to address the tech giant's poor track record on privacy in recent times. As Mark Zuckerberg himself notes: "Frankly we don't currently have a strong reputation for building privacy protective services". Facebook has been sharply criticised in the past over lack of user privacy and the spread of offensive content and "fake news". Close to $80bn (£61bn) was wiped off Facebook's share value in just days last March over the Cambridge Analytica scandal. Cambridge Analytica denied using the data to aid US President Donald Trump's election campaign in 2016, and claims it had deleted the information in line with Facebook's policies. However, the company's chief executive was soon suspended following further allegations. User numbers in the US - its second-largest market - have fallen by 15m since 2017 however, according to market research firm Edison Research.